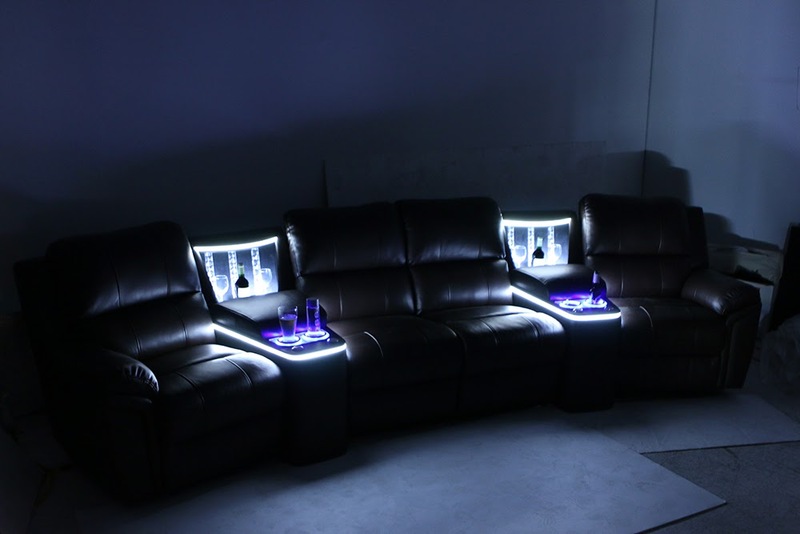 Your home theater is positively brimming with potential. No longer is it simply a room where you sit and watch a screen; over the years, a number of exciting accessories have been introduced as available options in home theater seating, which have greatly expanded the entertainment capabilities at one's disposal. Lighted cup holders, ambient base lighting, wine glass caddies, cigar hosts, tablet holders, in-arm storage, and tray tables can turn your seat into an all-in one experience: add tray tables and use your seat as a dining area, or use a tablet holder to tap into the power of the internet. Wine glass caddies enhance an evening of romance, or perhaps a chance to unwind after a long day at the office. Now, Seatcraft is proud to introduce another transformational accessory, which comes with the Madison Refreshment Sofa--a refreshment console, which is designed to turn your theater into a full-fledged bar! This stunning accessory is small enough to slot in as a wedge in-between seats, and yet packs a lot of use within that space. This swanky addition to any row is crafted from Leather 7000, an exclusive brand of top-grain leather that is carefully hand-picked from the top third of all hides. Leather 7000 features a supreme texture and smooth luxury appearance, which is then buffed to a sleek, polished perfection. This material will go especially well with seats that are also fashioned with Leather 7000, such as the Aston, Grenada, and Turino, and is offered as an upgrade for these items. The back section of this wedge console contains an upright storage unit with enough space to hold glasses, bottles, and other drinks. It's gorgeously back lit from behind, which allows you to see in a darkened theater, all while providing an incredible bar ambience. It's so easy to reach behind, grab what you need, and have enough drinks close at hand to satisfy the needs of a small party of friends or family. Meanwhile, an in-arm storage compartment at the center of the wedge contains plenty of space to store more beverages--there's even enough space for ice, to keep everything cool and fresh. The front of the this console contains lighted cup holders, whose gentle azure-violet glow matches the exciting marquee ambience of the lighting in the back section. In this way, drinks are kept safe and secure in front of you--and with the bar within arm's reach, you never have to leave your seat for refills. In addition, a framed accent wraps around the entire wedge, enhancing the overall lighting so that when the lights are turned off, your new console will look simply awesome. This console will instantly become the centerpiece of any party, or a romantic night spent in with a loved one. The Madison Refreshment sofa is also much more than its centerpiece console. 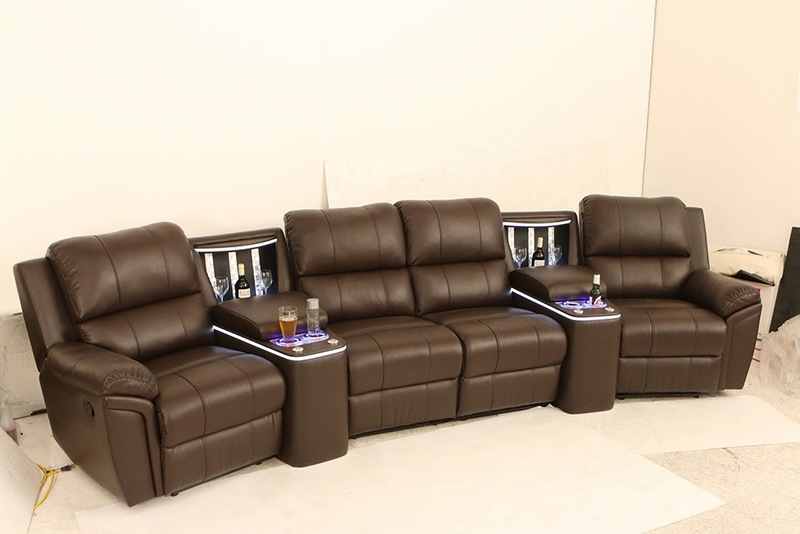 This sectional, similarly crafted from Leather 7000, also comes with a handy USB/power recline switch, from which you can charge cell phones or laptops, or lay back in seconds with a chaiselounger that provides a firm buttress of support to the lower body. Padded armrests add to the level of swank comfort, also provided by padded headrests. Meanwhile, included tray tables allow one to place food, remotes, reading materials or other items within easy arm's reach. The level of high class and craftsmanship here is a firm signature of the Seatcraft brand.